Posted in Manufacturers of Papad in India	. 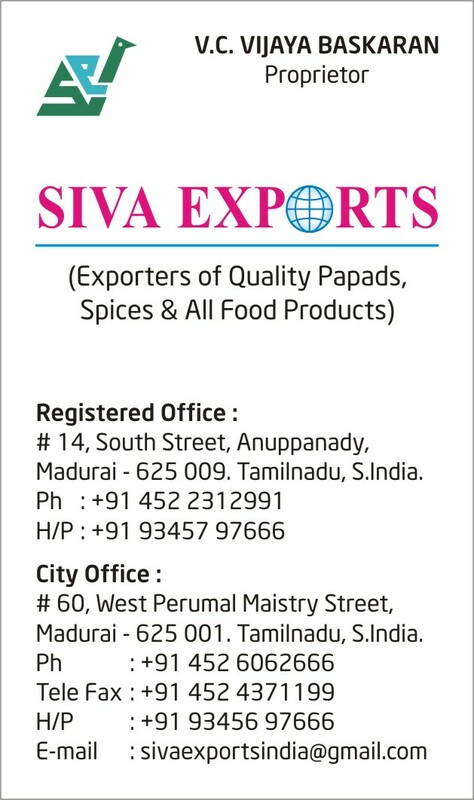 Siva Exports is one of the best appalam manufacturers in madurai. We are manufacturing a Export quality appalam since four generations. We are a manufacturers of pappads and appalam for the past 45 years in Tamilnadu, madurai. Also We are in the wholesale business in tamilnadu. Sizes are available from 2″ to 6″. Besides that, Both Hand made & Manual made appalam available in our factory. We are exporting our Appalam to Many countries such as Malaysia, Singapore, Sri Lanka, Maldives, Australia etc. 1)We are one of the best Appalam Manufacturers in Madurai. 2)Also We are one of the best Papad Manufacturers in Madurai. 3)Presently We are the leading manufacturers in the world. We are very interested to supply our products to you as per your requirements. We are offering the various ranges of appalam to our valuable clients. Generally The Appalam is the great side dish consumed all over the World. We are selling at very low cost. We are Supplying all over the world. Best Brand in the city. Presently Available in variety of taste and ingredients, we are offering a wide range of Garlic Appalam. Garlic Appalam is used as a tea time snacks amongst our clients. we have dealers across India for our quality products. Also It is typically serve as an side dish to a meal in India. we present the finest range of products. It is Hygenic man power hand make products. So that it is very tasty.